Carol Ai May, vice president of City Mill, is entering her third career, as a jewelry designer. She wears pieces from her Lampwork Collection. The necklace is $290, bracelet is $140, cuff bracelet is $150, and earrings are $50. In the days before Wal-Mart and Kmart, when fabric was inexpensive and it was more economical to sew than buy clothing, Carol Ai May was sent off to Singer Sewing School, and once she had learned all the basics, at age 11, her mom broke the news: no more store-bought clothes. After she recovered from the initial shock, she said, "I had no option so I just started sewing my own clothes. I was the good obedient Chinese girl. "It sort of freed me to get good at sewing and crafts. 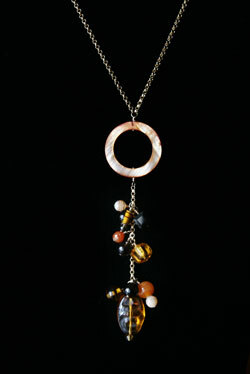 I took classes in jewelry making, glass blowing. I've always been doing something creative." That creative streak led to an advertising career in New York and Hawaii, but she continued to take art and jewelry-making classes. Now, she's revisiting the creative skills she learned as a child, as the designer behind the Red Box Jewelry Collection, all the while continuing to tackle the demands of her other career, as vice president of her family-run business, City Mill. The Easter party and other special-occasion gatherings will continue as normal at Carol Ai May's home, but friends and family don't see the production that goes on before and after get-togethers as she scrambles to stash all the evidence -- the findings, the glass and crystal beads, semiprecious stones and Thai silver -- of her marathon jewelry-making sessions for her Red Box Jewelry Collection. "My kids are in college now, but they've watched me take over the dining table," she said. "If guests are coming, I'll put everything away, but once they leave, out it comes again. "If it's just me and my husband, we'll just eat on one end of the table, but I might put a bunch of flowers in the middle to hide all my stuff." Red Box packaging makes gift shopping (hint: Mother's Day) a no-brainer for men. 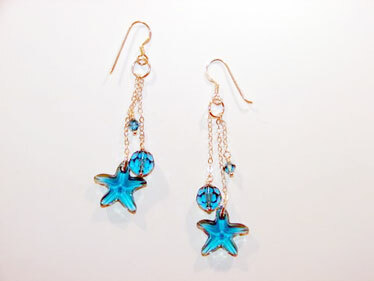 Starfish earrings from the Diamond Head Collection. Her husband, Mike May, president and CEO of Hawaiian Electric Co., has offered to help her convert one of her sons' bedrooms into a work studio, but she's not sure that would be wise. "I told him, 'Honey, then you'll never see me again.'" And that just won't do, because while many designers cite elements of nature or women friends as the inspirations for their creations, May's inspiration is her husband. Her lines are named after the romantic destinations they've visited together, from Tuscany and Venice, to China and Alaska's Glacier Bay. More important, her line was created to take the fear out of gift-giving for any man. "I wanted to do something that would be a no-brainer for men. They just can't seem to be able to find and wrap a gift. Mike's gifts are super-thoughtful but I know he panics. I think all guys panic when it comes to gift-giving." She found a simple but elegant red box with a self-ribbon and bow to add the finishing touch without involving tangled thumbs, twisted tape or the possibility of putting out one's eye with sharp scissors. And the color speaks volumes. "It's a good Chinese color," she said, that signifies good things -- romance, love, passion and good luck -- in several cultures. 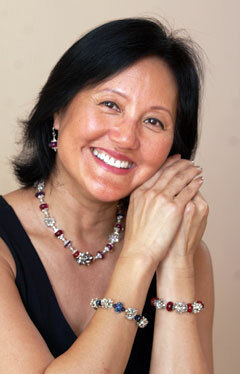 Busy women can go from morning to midnight with a subtle mix of beads, matte and clear glass, and crystals. 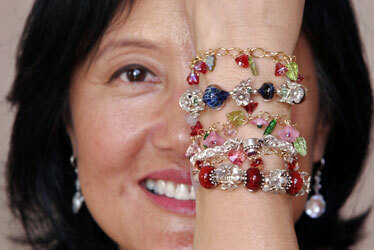 Carol Ai May shows some of her bracelets. For women, she's come up with designs suitable for dawn to dusk, low-key enough for the office, with the subtle shine of a few well-placed crystal or glass beads to catch the light on evenings out. "I don't want it to be exorbitantly expensive, just affordable and fun." 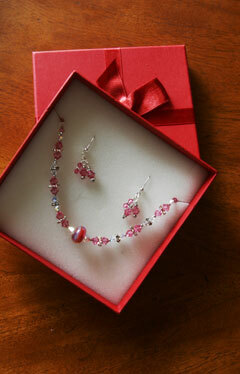 Prices start at $20, and a boxed set of matching Thai silver- and glass-bead necklace and earrings would run $90, $20 less than what men typically spend on a Valentine's Day gift, according to retail surveys of spending habits. The Red Box Jewelry Collection is available at the new Ward Warehouse boutique, the Place, which specializes in clothing, accessories and home items focusing on five aspects of personal style: yoga Zen, edgy rock 'n' roll, preppie conservative, urban bling and posh jet-setter. Ai May's designs fit into several of the categories. 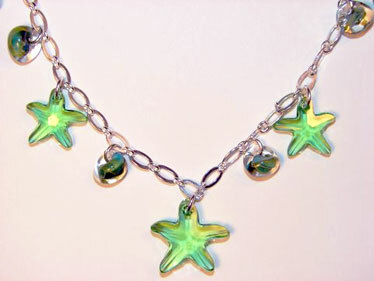 The Diamond Head Beach Collection, featuring delicate blue and green glass starfish on silver chain, fits easily with a peaceful yoga Zen lifestyle. Her Tuscany Collection features rich, warm, sophisticated gold tones that might appeal to the posh jet-setter, and her black-and-white Glacier Bay Collection has a spare mod look suitable for both the jet-setter and the edgy rock 'n' roller. 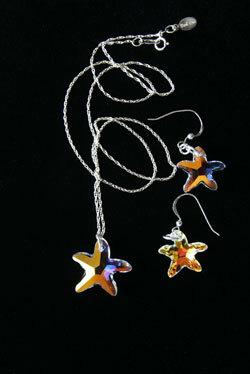 Starfish from her Diamond Head Collection and at bottom. A Lampwork Glass Collection highlights handcrafted glass beads that possess enough sparkle to pass for urban bling. Ai May has been drawn to glass since she was a teenager, as evidenced by dozens of glass paperweights, perfume bottles and vases she's collected over the years. "I have an appreciation for the art form. I really want to take a class in lampwork," she said. "I really want to learn how to make everything so that I at least know how to do it." One example is the crochet techniques she's incorporated in some of her necklaces. "I want it to always be fun because this is my stress relief," she said. "I'm lucky enough to have a day job I actually like and I'm going to stay in, but it's also a very stressful job." 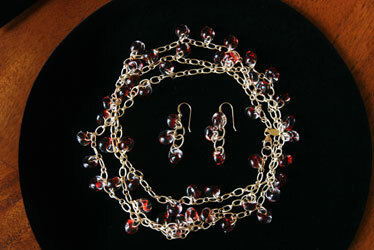 A necklace and earrings from her Lampwork Collection. View some of the Red Box Jewelry Collection online at www.redboxhawaii.com.